Image reproduced courtesy of the University of Glasgow Archives & Special Collections, University collection, GB248 UP5/4/7. Finandra/Fanandra Nath Bose (1888/9-1926) was born in Calcutta, India. Beginning his studies at Jubilee Art Academy, and following onto Calcutta Art School, he left for Europe with the intent of studying at an art institution in Italy or the Royal College in London. His applications were unsuccessful, leading him to the Board of Manufacturers School of Art in Edinburgh 1905. 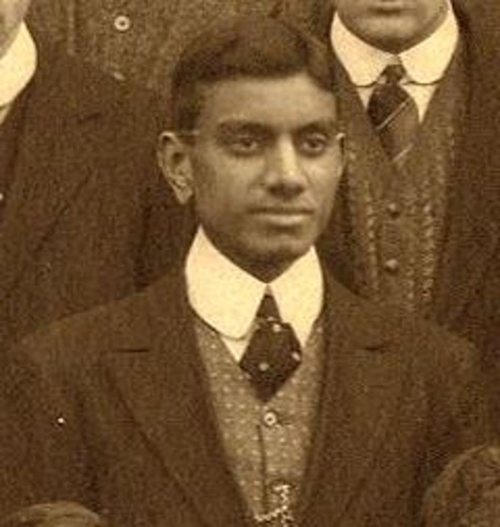 Records from Edinburgh College of Art of Bose exist from 1908, and he was awarded his diploma in 1911 (University of Edinburgh Art Collection). 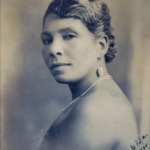 He gained a travel scholarship offered by the University of Edinburgh and the Bengal Government that allowed him to continue training as a Sculptor under Percy Portsmouth of ECA. From Portsmouth, ‘Bose excelled in small sculpture; he had a phenomenal control of minutiae. It was most interesting to watch his beautiful hands manipulate his sculpture…he was an excellent craftsman, a true artist, showing delicacy and taste in everything he did’. He then moved to Paris to work under Auguste Rodin 1912-1915, which led Bose to being part of ‘the new sculpture’ movement in Britain, a movement taking inspiration from Parisian artists such as Rodin and M.J.A Mercie, where the creation of small figurative statues focused on realism, movement and symbolism (Mitter, 1994). Bose’s sculptures can be seen in multiple locations across Scotland, including a War Memorial (1925) on the Main Street of Ormiston, East Lothian, as well as ‘St John the Baptist’, designed for St Johns Church, Perth. He has been described as the first Indian sculptor to achieve recognition in Great Britain, and is one of the first international artists to become a member of The Royal Scottish Academy in 1925, where his work was exhibited regularly (McEwan, 2004). Bose received various recognitions for his work in the UK and India, receiving patronage from William Goscombe John, who donated the works ‘Boy in Pain’ and ‘The Hunter’ the National Museum of Wales. In India, he was commissioned by His Highness the Gaekwar of Baroda (1914) to create a series of bronze sculptures of people of importance of Baroda. Commissions also included Laxmi Vilas Palace gardens and Baroda Gallery. During his time in Baroda, Bose taught briefly at the Fine Arts faculty of Baroda College (Mitter, 1994). Bose married a Scottish woman and opened a studio on 4 Belford Road, Dean Studio in Edinburgh. His assimilation into both Indian and Scottish culture was something of a conscious factor for Bose, with several sources citing his interest in the relationship between Indian and Scotland. Bose said that ‘at a moment of strained relationships between Britain and India, this honour would reassure Indians that the Scots did not wish to thwart their legitimate aspirations” (University of Glasgow History of Art and HATII, 2011). Presumably the same man, a Fanindra Nath Bose (b.1889?) studied at the University of Glasgow within the Department of Engineering and Naval Architecture 1909-1910, gaining a BSc (University of Glasgow). Bose passed away in Peebles, aged 37. McEwan, P.J.M, 2004. Dictionary of Scottish Art and Architecture, Glengarden. Mitter, P, 1994. Art and Nationalism In Colonial India, 1850-1922, Cambridge University Press, Cambridge. University of Glasgow History of Art and HATII, 2011, Fanindra Nath Bose ARSA, online database available at [http://sculpture.gla.ac.uk/view/person.php?id=msib6_1203417853] accessed 13/09/18. 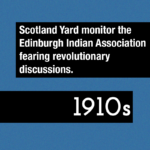 OLDER1910s – Scotland Yard monitor the Edinburgh Indian Association fearing revolutionary discussions.